95 looks came strolling down a makeshift air terminal at the Grand Palais, which I'm guessing is the biggest runway venue there is. But that is Lagerfeld, go BIG and go BOLD, why the hell not? And frankly, go with the fanciful whims blowing through his cerebral hemispheres. I must admit that there will be looks and ensembles which leave me scratching my noggin, but with such vast capacious collections, invariably there will be at least 50 or 60 looks that would leave me drooling and probably 20 that I'd trade a minor organ up for. Typically these are the demicouture dresses blessed by intricate byzantine embellishments that continue to fascinate year after year, only truly appreciated up close, maybe under a loop. Thank you Lesage. There will always be intersecting style arcs in his grand assemblies, with the iconic tweeds looming large. The collections are happily eclectic, including the casual and the over-the-top ostentatious. My read of the Lagerfeld collections is that the Kaiser isn't looking to accentuate the feminine form a la Dolce & Gabbana or Tom Ford (or Balmain or Altuzarra), OR to make sure that the pieces are slimming. Rather, his assemblies seem to be a manifestation of his latest ideas or dream time conjurings. Of course this is only conjecture on my part. Even though a spring collection, there is no mistaking the gravitas permeating the collection, in the multicolored tweeds, layered ensembles, and exquisite Lesage magic. The tweeds won't be for everyone, as they can be heavy, and add the illusion of extra weight. Especially the jumpsuits. Double yikes for some of us smaller folk. (I admit to committing a fashion indiscretion circa 2012, getting a black Chanel tweed jumpsuit…..but it was RUNWAY I thought….and maybe I'll use it for traveling….as if I had the fortitude to unencumber myself in one of those micro heads at 35,000 feet. Oh well, live and learn). The good thing about these suits? Blazer and skirt are sold separately, so if you just want ONE iconic piece for the year or the next 10 years? Just get the blazer! If the suit or coat is too much? Just get the bag, a recapitulation of the outfit or collection. I happen to be a big fan of the Bigbird dresses and skirts, always quite whimsical and engaging. Takes guts and a well lined mattress to pull off. I love some slim pants under a skirt or partial skirt. When you want subtotal coverage of the epidermis. This is about as close to "spartan" as Lagerfeld ever gets----thank goodness. (Let someone else handle that vibe). An homage to 60's Jackie Kennedy (pre "O"). Simple but sweet and timeless. Spice up with a hat, pastel scarf and or gloves! 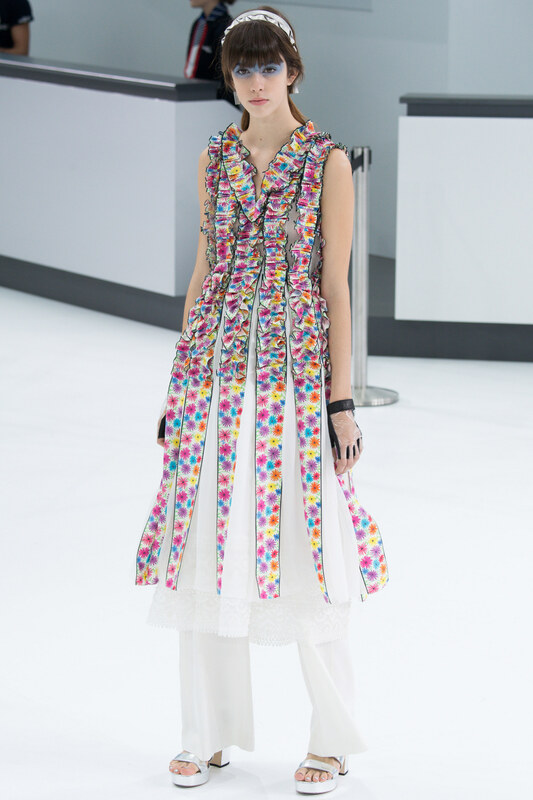 The Chanel suit is forever, the mini component adds a mod touch. COLOR, COLOR, COLOR! 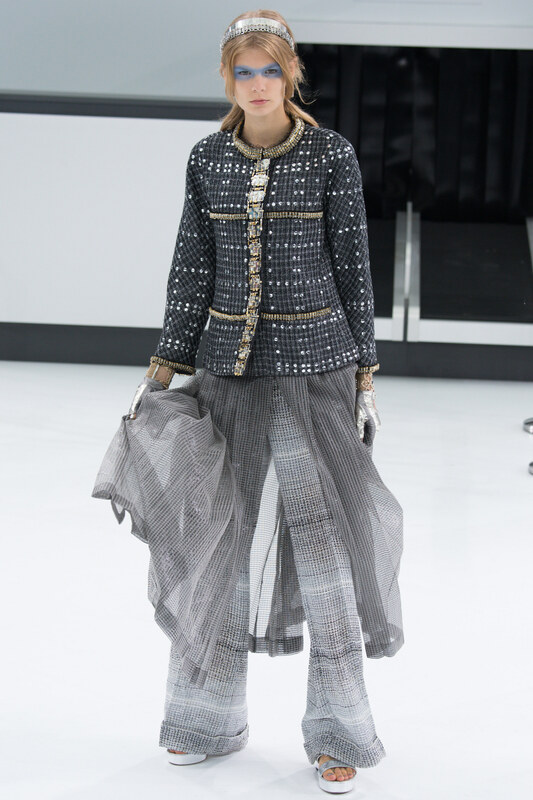 A perpetual theme throughout the Chanel collections. Well, if it must be denim, let there be a big flounce and let it be CHANEL! (Otherwise, dubious). And then glam up with layers of faux pearls. And maybe some little red gloves. I love this "jacket", the color, the ribbon. Would be fabulous over jeans and some bold platform shoe booties. The tried and true admixed with the wacky and unexpected. A magical way to stay covered up……yummy! The ruffle ain't going anywhere. Get used to it! Mmmmm, not your average sun dress. Yet another dreamy pastel concoction…. D A M N! Get out the DISCO ball for full sparkle effect. Crystals to infinity and beyond. Beware, the metal detectors are sure to go off with the last looks! As per usual, Lagerfeld provides something for everyone, of every age (past high school at least). ENJOY!